Yes, a vignette is that strange filter on your Instagram. But is also an interior design term that means groupings, normally on tables or shelves. Get creative! Snaz up your sweetheart table, the sign-in table, or even the altar or window ledge behind you during your ceremony. Use accessories like photos, mirrors, flowers or other foliage, vases, candlesticks, and other touches that have personal meaning to you and your groom, your parents, or your maid of honor. Here are 5 tips for creating vignettes that will fit your theme and your budget. Remember, less is more! If your wedding is going to be more casual — think bohemian and elopement — you can play with more asymmetrical groupings. Heights of objects won’t need to be perfectly balanced, colors don’t need to be the exact same hex code or Pantone. This sweetheart table stuck with the white roses that decorated the guests’ tables and the bride’s bouquet but varied the vase heights and the textures: from beveled silver to clear glass. Notice they also kept it very symmetric. 2. Pick a light source (and move away from the wall). Don’t put your bridal portrait in a dark corner! Arrange a tableau near a window, or around a lamp. If candles are a major element in your design, make sure they cast enough light. Nothing about your wedding day should be dark. You don’t want all of your decorations and hard work lost to the shadows. While well-stacked and colorful, this yummy vignette was up against the wall, making it a little dark and less of a focal point. Now, if this had been in line with a Halloween or Festive Fall theme, it may have been enhanced with strategic candles to at least create some flickering mood lighting. The aim is to create interest that moves your guests around the space to look at the table centerpieces, the sentimental trinkets on your sign-in table, the cake pushed toward the front. Not everything needs to line up, but everything needs to be well-lit. According to Wikipedia, ‘things that come in threes are inherently funnier, more satisfying, or more effective than other numbers of things.’ Your vignette should make a statement, as bold or as simple as you’d like. So keep it balanced. Human brains have decided that 3 is the magic number. It isn’t too many objects so that your shelf or your table looks cluttered, and it isn’t too few so that it looks bare and unplanned. It’s like your favorite layered necklaces. Lead your guests’ eyes up and down across & around the whole ceremony space, directing them to where you and your beloved stand. Think of your theme. Do stacked books suit you and your love’s personalities or interests? What about pedestals that mirror the archway you’ll be standing under? Mix shiny objects with rough wood and natural greenery. 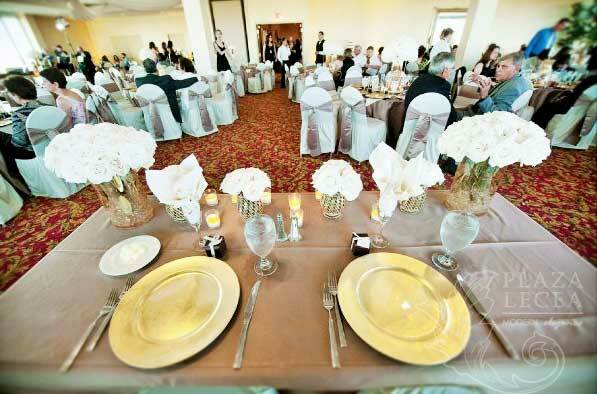 Arrange iron chandeliers with soft yellowed lace. Layers create depth and therefore visual interest. 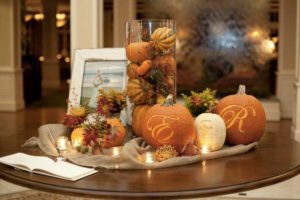 Notice the play with heights between the glass of tiny gourds and the tea lights, the color coordination and a contrast between the bridal portrait and rich fall colors, and the textures of the weathered frame, the glass vase, and the burlap table runner. 5. Stick to your theme! If you have live peacocks at your venue and really want to show them off, make sure your centerpieces feature peacock feathers and coordinating jewel tone table confetti or candle holders. If you’re walking down a sandy aisle in your bare feet to the sound of waves crashing, incorporate seashells and fishnets. 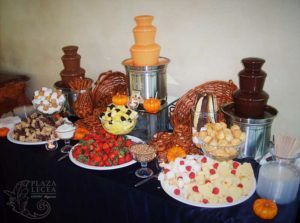 The aim of the vignette is to create visual interest that accentuates and compliments the event, not distracts from it. Don’t be afraid to break the rules. If a perfectly monochromatic table setting is what you want, go for it. 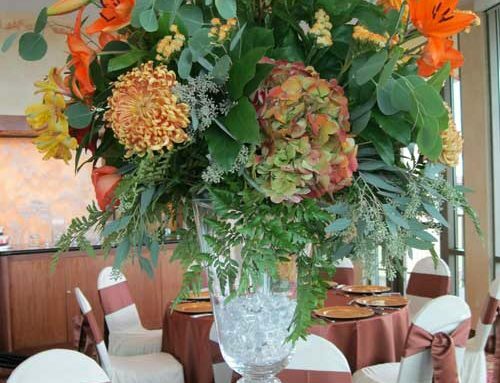 If it’s super windy, you may not want teeteringly-tall vases or picture frames. It’s your day, so make it your own. 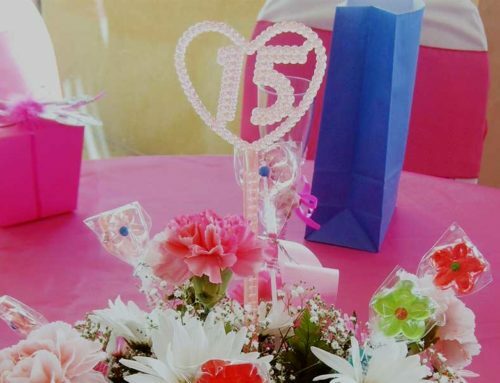 Quince and Sweet 16 Inspiring Themes! 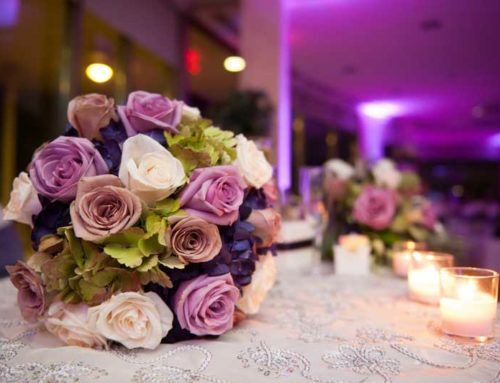 Outdoor Wedding verses Indoor Wedding, which is right for you?